Precision All Natural™ Weight Gainer provides a clean and efficient way for athletes to increase their intake of both protein and calories while avoiding unwanted artificial ingredients. 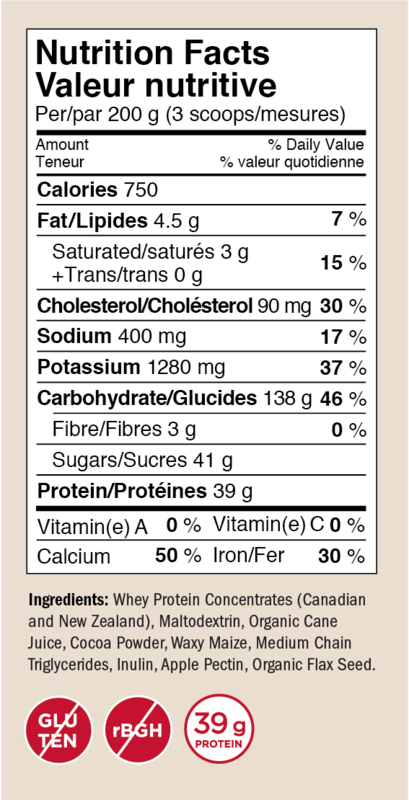 The protein is derived entirely from a blend of whey proteins produced domestically here in Canada as well as imported from New Zealand. In both cases, the cattle are raised without the use of the milk inducing hormone rBGH. Precision All Natural™ Weight Gainer is an excellent source of protein which helps to build and repair body tissues. It also provides a complete profile of essential and non essential amino acids including over 8 grams (per serving) of the branched chain amino acids Leucine, Isoleucine and Valine. Precision All Natural™ Weight Gainer tastes great and easily blends into a rich and creamy high protein shake or smoothie. For best results use a blender.